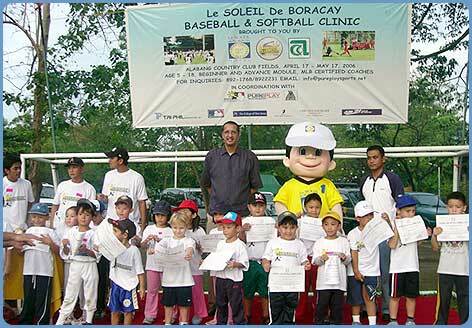 With their parents and families in tow, around 70 participants of the Le Soleil de Boracay Baseball and Softball Clinic received their certificates and medals as part of their culminating activity. Held at the Alabang Country Club, the event was conducted by the Junior Baseball Softball Federation of the Philippines (JBSFP) for the young athletes aged 4-15. All the coaching staff were certified by the Major League International. Participants were divided into teams according to age groups: Cebuana Lhuillier for ages 4-6, Pera Padala for ages 7-9, Just Jewels for 10-12 and All Care Insurance for 13-15 years old. Teaching techniques were also based on the skills level of the participants. Cebuana Lhuillier Special Project Assistant Danny Francisco, who came to award the prizes, congratulated all the participants and reaffirmed the company's commitment to support sports development for the youth. "Our company, Cebuana Lhuillier, is very proud to have been part of this event as it is the vision of our executive vice president, Jean Henri Lhuillier, to cultivate programs that will help promote sports awareness among the youth," Francisco said. Earlier in the day the participants engaged in a skills competition where they were able to apply the skills they learned during the 10-day clinic. Participants who excelled in the different aspects of the games such as pitching, hitting, running and throwing received medals. Sportsmanship awardees meanwhile, received special prizes such as All Care Insurance coverages from P. Lhuillier Insurance Agency (PLIA) and gift certificates for a two-night stay in Le Soleil de Boracay (www.lesoleil.com.ph).